On Monday, at Sotheby’s, the first part of a highly anticipated auction of Judaica – the Steinhardt Judaica Collection – was held. 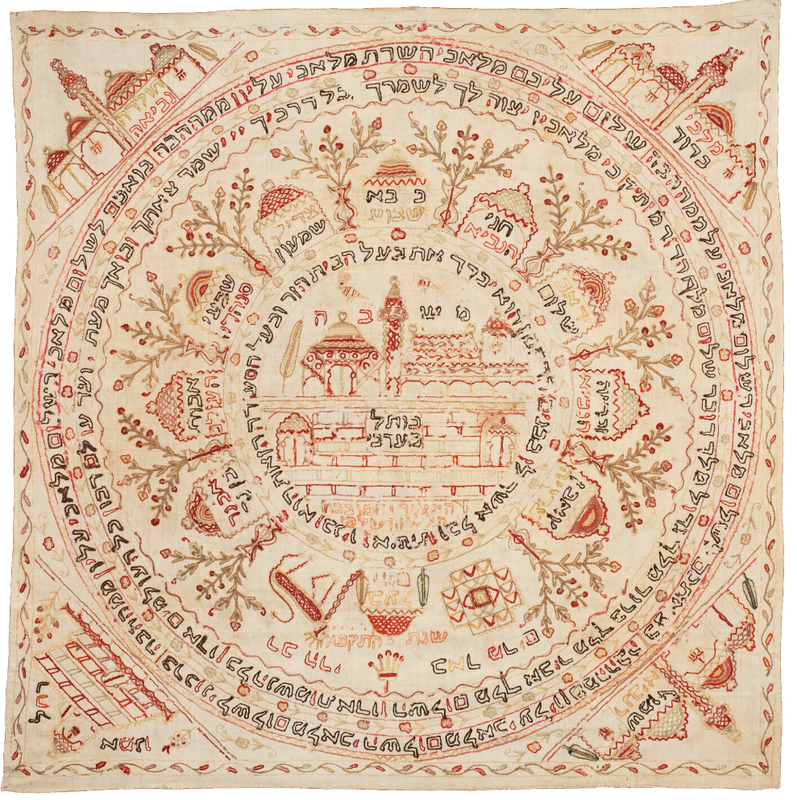 While there are exquisite pieces of all types, including a beautiful illustrated Mishneh Torah worth millions of dollars, today’s auction included an unanticipated bidding war over a 19th century tablecloth. The estimated price for this piece was between $20,000 and $30,000. It sold for an astonishing $137,000. This colorful Sabbath tablecloth embroidered with images of the holy sites of Israel is one of an exceptional group of decorative textiles created in the Holy Land in the nineteenth century. In the central panel, the artist has featured an idealized vision of the sacred sites of the Temple Mount; the Midrash Shlomo (Solomon’s school) Bet Ha-Mikdash (The Temple) and the Kotel ha-Maaravi (the Western Wall). Surrounding the central panel are ten pavilions each denoting a tomb of one of the famous men or sages of Israel. In addition, the well of Miriam is also depicted and a fanciful chained lion represents the tomb of Rabbi Solomon Luria (known by his acronym as Ha-Ari = the Lion). In the outside corners are depictions of the tombs of Rachel, Samuel, Hulda the prophetess and the Kings of the House of David. Several prayers recited on Friday evening at the start of the Sabbath meal, (including Shalom Aleichem) are decoratively inscribed in concentric circles. and one related Torah Ark Curtain in the collection of the Jewish Museum, London (#53). The present cloth is the only one of this group to be both signed by an artist, Nachman the son of Hillel the Yerushalmi, as well as dated, 1821. More importantly, it is both the earliest example of this genre as well as one of the earliest extant dated objects of Judaica to be created in Jerusalem in the modern period. Why would a tablecloth sell for such an astonishing amount? Perhaps because this is simple yet powerful proof of the centrality of Jerusalem, and specifically the Temple Mount, to Jews – a truth that too many people nowadays downplay or ignore. The tablecloth also displays a small inkling of the richness of Jewish history in the Land of Israel, and it beautifully demonstrates how Jews and their land are inexorably linked.